Let me begin this post by saying, "I agree." I agree that students should have recess and play outside. I agree that young children need to interact in a face-to-face setting. I agree that it is developmentally critical to engage with paper, paint, blocks, crayons and even the dirt on the ground, because elementary students need to experience the physical world. However, I also agree that social media pervades all aspects of modern society, and it has become an imperative for us as educators -- and parents -- to model appropriate digital citizenship to even our youngest learners. Do I really believe that toddlers should have Twitter handles? Not really. But we do need to introduce children to the virtual, social world around them in appropriate and meaningful ways? Definitely. Students already have enough screen time. Students need to be able to communicate in person. Students don't need to know about social media at this point -- it isn't age appropriate. If we honestly think about it, we were all taught the "social media" of our time in early elementary school. Remember the friendly letter? How about thank you notes? Telephone etiquette? In early grades, none of us were expected to master these skills independently, but they were integrated into our curriculum so that effective social behavior could be modeled at a young age. As I said, I agree. However, if used effectively, social media can transform a student's learning experience. Here are three examples from classrooms that also agree, but who also leverage social media to extend the learning context, model effective communication, and empower young students to develop their voice. If you step into my classroom you will quickly find out that we are a classroom with no walls. Video conferencing, blogging, creating videos and books, teaching and learning from other peers in the classroom, in the school and in the world about what they are interested in is embedded into the daily instruction of my classroom. The result of this purposeful connectivity is that my group of grade 1/2 students has begun to develop a global perspective of issues that could not have been authentically discovered if they were solely engaged in books in our classroom. In just the past few weeks, Kristen Wideen's students have shared math stories with a class in Iowa and frog data with a class in Singapore. Engaging in social media is part of their daily routine: checking their class Twitter account (@MrsWideensClass), blogging during literacy centers, and even checking on their tadpoles via live web cam. This recent post provides an amazingly detailed view of life in a connected classroom. Kristen Wideen originally created a class Twitter account so that her students could begin to engage in the cultivation of their own Personal Learning Networks (PLNs). Her students not only learn, but also share their learning with a broader community. Whether through whole-group Twitter activities and Skype, calls or individual KidBlogs, these students recognize that there are connections to be made beyond their Ontario classroom -- all while working on their reading, writing, communication and collaboration. Social media enables the creation of meaningful connections. In Kristin Ziemke's first grade class in Chicago, this occurs through use of Twitter (@Burley106) and KidBlogs. Initially, the process began with Tweets from the Rug. As a class, the students shared, and continue to share, their learning with parents, other students and a broader community. Collectively, they would discuss their learning experiences as a class, before Tweeting out their thoughts, questions and ideas to their broader learning community. My students were empowered to be part of a learning network that was for students, by students. So often, young children only have access to information that is filtered through an adult channel. While oftentimes that is appropriate, kids also need the model of other children as information providers. By watching a peer research, report and field questions, student now have a mentor experience for what it looks like and sounds like to be an information sharer. On February 1, one of Kristin Ziemke's students, Becca S. taught adults how to use Croak.It on her KidBlog. Not only did social media empower this student, but it also provided her with a global audience. In 18 days, she received 42 comments from teachers, family members and other adults from across the continent. By empowering her students with the use of social media, Kristin Ziemke connects them to a global audience and introduces them to the complex communication required to be effective digital citizens. For teachers who have only started to explore the uses of social media for their own professional development, much less with their students, setting children loose on blogs or Twitter can seem daunting. However, as illustrated by Ashley Johnston and Jack Parrish at the Trinity School in Atlanta, paper could be the best teaching tool. Before we could ask our students to set up a blog on the Internet, they needed to understand the building blocks. What catches the eye? How do you express yourself? How do you express your topic and yourself? Whether you introduce social media to students through a class blog, individual student blogs, Twitter or paper, there is no "right way" to begin. Do I really feel that toddlers should Tweet? Probably not. 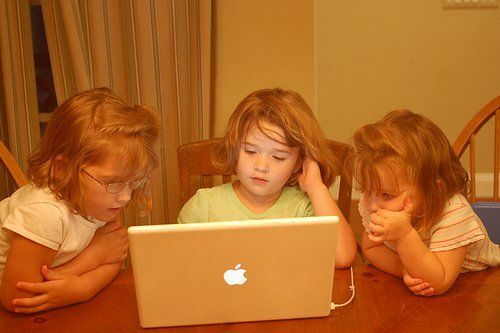 However, what's important is that we introduce all children to social media in appropriate and meaningful ways, regardless of their age, such that they can connect to a global audience and develop as empowered, networked learners.